I wish I loved to make bread. I really do. I love the smell of fresh baked bread. I love the taste. I love the texture. I love the warmth. When I was in the first year or two of growing my blog, my mom introduced me to a blog called, “The Baker Chick.” We would (and still do) call each other up on the phone before we turned out our lights for the night and “oooo” and “ahhh” over what The Baker Chick made that day. Everything on her blog we want to try. Even if it was flavors and food that we normally wouldn’t pick out, her photos and stories made us want a piece, slice, taste of whatever is was that she made that day. Her blog is still my mom’s favorite blog to read (with the exception of mine, right mom?! ;-) ) And as soon as my mom saw her post this recipe, she immediately called me and said, “Nikki! Did you see the bread Baker Chick made today?! It is perfect for you because it says it is ‘NO KNEAD! '” My attention was grabbed. I hopped on over to the Baker chick and saw this DELICIOUS looking bread that seriously made me want her to just cut me a slice and pass me it right through my computer screen. I HAD to try it. And guess what?! It is just as easy as she says it is. And now you have my word. It is EASY. Seriously fool-proof. It has the crispy, crunchy crust you love on artisan bread and the soft center. Slab some butter on it or dip it in a balsamic vinegar-olive oil mixture and you will be in heaven. *Note I used a dutch oven. I use a Le Creuset. If you don’t have a dutch oven, The Baker Chick said in her post that any heat-safe covered pot will work fine as long as all the handles and knobs can withstand the 450 degrees F required for this recipe. This bread is incredible and is fool-proof! As easy as it gets when it comes to bread making! Combine the three dry ingredients in a large bowl then pour in the luke-warm water. Stir until completely combined. Dough will look messy and not smooth and that is completely okay. Once combined, cover tightly with plastic wrap and let sit on the counter overnight. I let mine sit for about 15 hours. Let it rise anywhere from 12-18 hours. Dough will be puffed up appear bubbly and be sticky. It won't be in a ball shape and that is normal. When dough is done rising and ready to bake, preheat oven to 450 degrees F.
Heavily flour clean counter top or surface. Turn dough onto floured surface and shape into a round ball. Cover lightly with plastic wrap (you can just lay the plastic wrap that you used to cover your large bowl over the top) and let dough rest. While the dough is resting, place your dutch oven into the oven for 30 minutes to pre-heat. After dutch oven has preheated, place ball of dough in the cents of the dutch oven and cover with lid. The Baker Chick said: You can put a piece of parchment under it if your dutch oven doesn't have an enamel coating. Bake at 450 degrees F for 30 minutes. After 30 minutes, remove lid and bake for an additional 15 minutes until done. Bread will be golden in color. I love baking my own bread, I just do it enough! It does take some planning, and I'm a spur of the moment baker. I love any bread that is "no "knead"! Wow! This bread looks like you spent hours on it! It seems so easy to make, too. The Baker Chick, who I got this recipe from, said this: "Any heat-safe covered pot will do, as long as any handles/knobs are safe to be heated up to 450F. The cover is what really locks the steam in and creates the perfect texture." Hope that helps. You can use a crockpot insert.. It will do just fine according to the reviews I lhave been reading on FB. How long should it cook for in a crockpot? Do you cook it on high?- gonna try to make this with gluten free flour! I love to make the artisan bread! Yours is beautiful! I have always used a pizza stone but I think I will have to try using the dutch oven. Pass the bread and the butter! Gorgeous bread, Nikki! I used to be in a cooking group with Audra and she has some great recipes on her site, for sure! I love that this is no-knead and you just forget about it for 18 hours. Reminds me of the Artisan Bread in 5 Minutes a Day principles where you let a super moist dough rise for a long time and then bake it when you're ready. Pinning - so pretty! And I love the story about your mom and blog-reading together! How cool! Oh wow yum, your bread looks amazing! Do you use a dutch oven like you would use to camp with that is all cast iron or have you used one that comes with a set of pans? I am thinking that my camping pan would smoke like crazy if put in an oven because of the oils it is treated with. My kitchen pan set has a black handle (square knob) that I am not sure if it is oven proof to that temp. Any suggestions? Which kind do you use? I know Costco, Sam's Club, and Amazon carry cheaper knock-off versions of my dutch oven. My mom owns one and loves it. Any heat-safe covered pot will do, as long as any handles/knobs are safe to be heated up to 450F. You can cover knobs or handles that are not oven proof with aluminum foil to protect them. I am SO trying this Nikki! Nikki! I stumbled upon your blog a couple of days ago...I LOVE it!! Seriously, I can't stop thinking about all of your delicious pictures and the recipes I am going to make for my family. I love to cook for them...especially when I have something fun to whip up! THANK YOU THANK YOU for all of your hard work! Nikki, this is gorgeous, I've seen lots of recipes for Artisan Bread but not one that let you leave the dough out on the counter. I'll bet this develops a nice sourdough flavor. Can't wait to try it! I too love freshly baked bread, but not the time and effort it takes to make it. I will definitely have to try this recipe! I love this recipe!! I love the idea of making bread too.... The waiting for it to rise is what gets me. This looks simple enough though I need to try it. Love all your recipes!!! Aw Nikki you are so sweet for your kind words! Thank you so much to you (and your mom) for reading- means so much to me.
! Thanks to you and Audra! I made this bread for dinner tonight. It was a hit. It does look like I am a professional breadmaker. It was crusty on the outside and soft on the inside. It was simple to make. If I can make it then anyone can. I love Audra's blog and her stories too! Your bread turned out fantastic Nikki! Love that crust!! I made this tonight, and I have to say it is the best (and easiest) bread I've ever baked! Thanks so much for sharing the recipe. asiago cheese on top just before baking and it was terrific. Just made half a recipe for tomorrow to see if turns out the same. Loved the crustyness outside and soft air bubbly texture inside, just like a professional baker made it. This is first time baking bread for me and love it !!!! Tried this today, it was wonderful and sooo easy! I was a little leery about this receipt., but tried it on a whim. As I watch this loaf bake in the oven and have the house smelling wonderful I have hope. Hope that I am not doomed to be a complete failure at bread baking. Thank you for saving me from that fate. I do not have a Dutch Oven can i used something else to make the bread. I use a insert from a crock pot that no longer worked. It works great. Done it many times. Just make sure it is one that has a all glass lid. I loved the recipe and the simple way to make it, definitely I"ll make it and I"l share my pic. So, I let the dough rise for 18 hours. I just tried to form it into a ball, but it's looking a little flat and sad. Hopefully it turns out as pretty as yours! Have made this a few times now and passed the recipe on to my oldest son who has made it also.We use a Camp Dutch oven and find no need for the extra cook time with the lid off since it is a heavier Dutch oven..I am making 4 loaves for Thanksgiving 2 to eat and 2 for bread pudding. Made a roasted garlic loaf by roasting a head of garlic and adding it when I mixed the dough and added some Rosemary on top before baking. Great site and great recipes THANK YOU!!! I tried this ,it's great! Looks very yummy and I can't wait to try it this weekend! I tried that today and it looks good, haven't cut in to it yet, just took out of oven. It's not as high as yours, what might cause that? I added garlic and basil to it and it sat for at least 15hrs if not longer. Can't wait to taste it. Once it has set for the allotted time and you turn it out of the bowl it just sits for 30 minutes while your pan heats. Swap out 1 cup of APF for Whole Wheat for a different taste and texture. I just devoured a piece of this No-Knead Crusty Artisan Bread and it is wonderful, and my picky husband (Brooklyn boy) loved it, asking for seconds! Definitely a must keep recipe and want to thank The Baker Chick also. I make this often. You can add things like dill seed, rosemary, crushed red pepper to it for a great sandwich bread. I also add dried cranberries, raisins and walnuts to the batter. Then when I dump it out of the bowl I kind of spread it out a bit and add cinnamon sugar, fold and do it over again until I have the ball made.. I always cook it on parchment paper. I am very anxious to try this. Just a tip to others, I have a great Dutch oven by Lodge. They are just like the Le Creuset ones but cost about $50! It is enameled cast iron, come in a bunch of colors, too. I cook everything in it, now I will be making bread too! I was wondering if you need to use the yeast that comes in the jar, or can you buy the kind that come in packs of three, open one, and take a teaspoon out? Thanks for this yummy-looking recipe! I can't wait to try it. Do you think you could substitute rapid-rise yeast for regular? That's all I have on-hand... wondering if anyone has tried that! Go for it, I have used both. No problems. Do you flour all sides when you turn the dough out on the counter or just the bottom? Making this again and it's wonderful! Thanks so much for sharing. Today's loaf has sea salt, chives and sesame seeds in it. YUMMO! I make this bread all the time! Soooo easy and I tweek it and sometimes use wheat flour and honey. It turns out great everytime. I have some rising now, just waiting on tomorrow for baking. I bake it in a round clay pot with a lid and it turns out perfect every time. So my kids an I made this bread this weekend it was amazing!! They are suggesting we made bread bowls for chowder out of this recipe so I have a question if I make a batch the after it rises split it into two balls how long would I cook one?? How much time should I cut off I would make two batches to make four bread bowls! Thanks amazing super easy and delishishness! Will a Pyrex glass bowl with cover work ? This is just the best bread I have ever made ........ ask my husband !!!! And I always make my own bread. A MUST !!!! For years we were told that a crispy crust was only possible with a steam injection ($$$) oven. This recipe changed everything; it makes awesome crusty bread. The fact that it is so easy is a bonus. I bought an enameled cast iron dutch oven specifically for this bread and it was worth every penny. Then again, I only spent $50 for a non-fancy dutch oven. Replace 3 once of that water with beer and take it to the next level! Oh love the recipe and the story of you and your mum sharing moments together over a blog. Reminds me of my mum. We spent many an hour pouring over the blog American Mum in Paris. It's wonderful to share such moments with your mum! I love....love....love this recipe!!! It is soooo easy!! I use different organic flours and give away as gifts. Everyone wants this recipe, and as I write this I have 2 loafs rising. I bake mine in a clay pot with the cover that came from Serbia. My bread always turns out perfect! Can this Bread freeze well. To save time and avoid a mess on your counter top you can mix the flour in to the dough in the bowl. Then just cover the bowl and let the dough rest in there while your dutch oven is preheating. This works if your dough is gooey. In this case I would also bake the bread a few minutes extra. In Finland this is a very trendy recipe and called "pot bread". And it is suggested to slighlty oil the pot after preheating and before adding the dough. Just made my first loaf (ball? ), it turned out great! I did not have the plastic wrap, so I used a quart zip lock baggie. I also did not have a Dutch oven so I used a 1.5 quart glass casserole dish and cover. I will definitely be making more. It was so easy and only 4 ingredients! Love it, thank you Chef in Training. Is there any alternative to dutch oven? I don't have one. 5 ***** For this bread. I've made it quite a bit (about a dozen times at least). That's for sharing your recipe. Unfortunately you did not mention greasing the pan before baking. My bread got stuck to the bottom of the Dutch oven and all I got out was the top. My instincts told me to greas the pan but the recipe did not say to. I made this to accompany a pasta dish this evening and it was wonderful! Nice color, great crust, delicious!! I will admit I sped up the rise by placing the dough in its bowl on top of a warm oven and it worked like a charm. Four hours later I was ready to bake. I would recommend this recipe to anyone! I have never had success with yeast breads outside of a bread machine. This loaf was crusty, moist, and delicious. A keeper for sure. This bread is excellent! 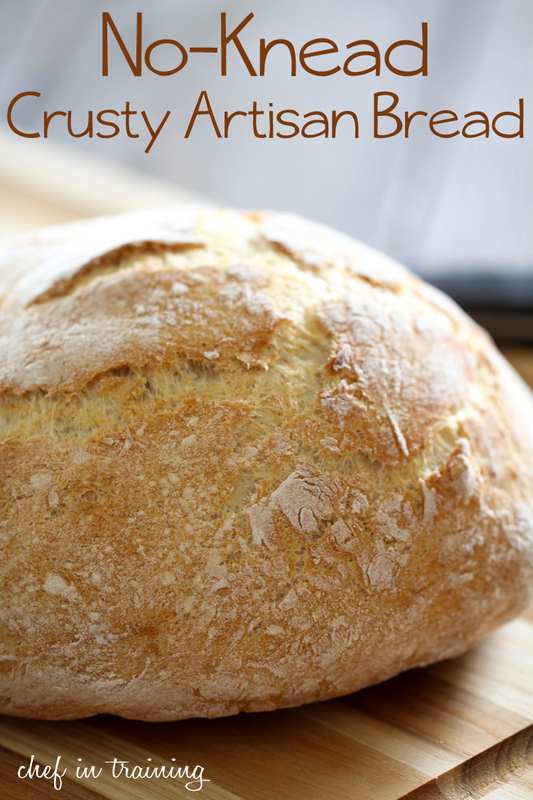 Very easy, crusty, and great texture. Really enjoyed making it. I had to add about 1/2 cup of water due to high altitude. Baked in stoneware, beautiful results. Thank you for the recipe .I made it love it. I made this in a sm pullman pan to make it easier to slice for sandwiches. Next time i am going to bake in individual loaf pans uncovered and add cheese and jalapeno for sm subs. Will let you know how it is. This bread is hard to slice without a good serrated knife.. The texture is just what I wanted and the plain tasted very good with a little butter. What capacity dutch oven so you suggest purchasing? Round or oval? Thank you for your feedback . I have made this recipe many times and it always come out perfect. My husband loves it too! Try adding parsley, sage, rosemary and thyme for some lovely Scarborough Fair bread! Mine seems to go flat rather than stay in a ball during final resting. Live in FL. Should I put a little less water in next time?